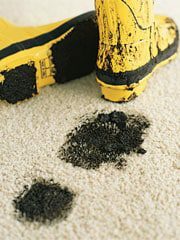 Spring Cleaning 101 – The Natural Way To Remove Stains. – On white items, apply white vinegar or lemon juice to the stained area. Allow to soak in to the fabric then wash as normal. The stain should come right out as if it had never been there! – If you happen to spill wine onto your clothes, grab the salt before doing anything else! Dump some salt on the stained area right away, which absorb a lot of the moisture before it sets. Wash as normal as soon as you can. – For red wine stains, chocolate or other dark stains that have been there a while, you can try to soak the item in a bowl of glycerine, available from your local grocery or natural store. Soak the clothes for a half an hour and then wash.
– Party guest spills red wine on your nice carpet? Get up as much of it as you can with a wash or dish cloth, then quickly pour white vinegar directly on the spot. Let it soak for a few minutes, then rinse it out with a wet rag. And then berate your party guest! – If your kids come in covered with grass stains, you can usually get them out by soaking their clothes in either glycerine or or washing soda prior to washing. And remember, always dab spots and do not rub. Rubbing will drive the stain further into the fabric. And when you wash, use cold water as much as possible to reduce your usage of the water heater. We wash all of our clothes in cold water and things are just fine!